Amongst all the exotic and everyday cars at the 1952 Paris Salon appeared this tiny Rosengart: the 4 CV Ariette cabriolet. The company was founded by Lucien Rosengart in 1923. Seeing an opening in the market for a small car, he purchased a licence to build the English Austin 7 and bought the old Bellanger factory in Paris to build it. 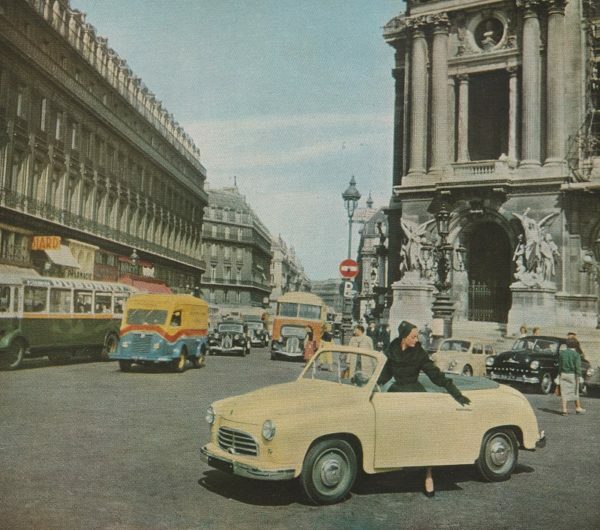 Rosengart never succeeded in achieving healthy profits on these small cars and he sold out in 1936 to a new organisation, Societé Industrielle de l’Ouest Parisien (SIOP). Post-war production started with the unsuccessful Vivor van, and after a few more failed attempts to introduce cars of various types the company launched the Ariette in 1951. This was the last Rosengart car, introduced at the Paris Salon at the end of that year as a two-door four-seater saloon styled by Charbonneaux. It was favourably received at the show, but its modern look could never compensate for the lack of power from its 747cc engine: 21 hp was not much more than the output of that same power plant when it was introduced in 1927, based upon the Austin 7’s 1922 engine. Its light weight and a four-speed gearbox with synchromesh on the top two ratios did their best to help performance, but its price did not: at 668,500 francs it was significantly more expensive than the Renault R4 at 458,000 francs. The cabriolet we see here was introduced in 1952 alongside the Break (station wagon), but neither of these greatly improved sales, so Rosengart introduced a stripped-down version called the Artisane, without the chrome décor or wheel trims of the Ariette. Bumpers were painted, and the car was only available in a dark shade of grey. A few weeks after the end of the 1952 Paris Motor Show SIOP was forced to file for bankruptcy, and late in 1952 the gates of the factory were closed with the loss of 1,700 jobs. Following negotiation with bankers and other creditors the plant was reopened early in 1953 and production of the Ariette resumed at the rate of approximately four per day, with plans for a rapid increase in those volumes. But the car was still too expensive to sell in sufficient numbers. The end came in 1955, after the company failed to launch its new car, the Sagaie, a development of the Ariette with a flat-twin engine.